Green Marble Mortar & Pestle - 3-3/8" x 1-1/4"
The genuine marble of this mortar and pestle set keeps odors and grease from penetrating. The set looks attractive on the outside with a high-gloss finish and has a buffed inside for better grinding. 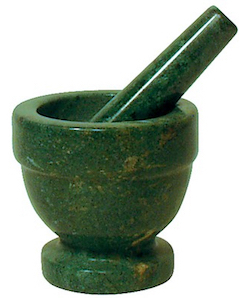 Mortars and pestles are great for crushing, grinding and powdering herbs, grains, spices, nuts, roots and teas. This style of grinding releases flavor best in seeds, herbs, spices and garlic.